Seattle museums look to foster a conversation with their spring visual art exhibits. At a time when people can barely separate facts from “alternative facts” in real time, history seems especially hard to trace. For a number of artists working and showing in Seattle, tracing neglected and omitted histories is not just a source of inspiration—it’s a pressing need. In the last year, we have seen a number of exhibits in Seattle that have helped enrich our understanding of local histories, especially of underground communities. Storme Webber’s Casino: A Palimpsest at Frye Art Museum looked at queer communities and people of color in mid-century Pioneer Square through a portrait of her own family. Seattle on the Spot, the ongoing Al Smith show at MOHAI, gorgeously documents Seattle’s early jazz clubs and the black communities around them. A proper reading of history does not rely on one official record written by the victors. This spring, we are seeing a slew of shows that expand our view of the past and present locally, nationally, and globally. Where these artists find omissions and misrepresentations, they help fill the gaps and encourage us to keep seeking for ourselves. In the case of Tavares Strachan’s work in Always, Sometimes, Never at Frye Art Museum, the interrogation of history occurs through lighted collages containing text from the Encyclopædia Britannica. No one presumes the EB to be complete, but its sins of omission are telling—even absurd—when Strachan homes in on specific entries. For instance, we get numerous, detailed entries on obscure devices of war and a full book report on Italian novelist Italo Calvino’s Invisible Cities, whereas the indigenous Ainu of Hokkaido, Japan, get … one whole paragraph. As a native of the Bahamas living in New York City, Strachan thinks globally. Sometimes his works can feel diffuse and arbitrary in their own right. While a lot of his collages aren’t impressive to look at individually, the concept is what’s key. Viewers should go judge for themselves, but for those who want something really heartfelt and local, there are two other highly recommended shows. One is Everyday Black at Northwest African American Museum, a showcase of photos by artists Jessica Rycheal and Zorn B. Taylor. The two contemporaries put their viewfinders on members of our region’s black community. Taylor focuses on his immediate community and extended family, and Rycheal on activists young and old. “Revelatory” is the term used by Everyday Black’s curator C. Davida Ingram when describing the two artists’ practice: “They show us several layers of meaning that conserve and upset what blackness is and is not.” Ingram has been quite busy this month, as she also just opened a show of her own work, A Book With No Pages, at UW’s Jacob Lawrence Gallery. She also chooses activists, artists, and educators from her community as models, but her approach is different. Whereas Everyday Black focuses on more candid portraiture (as the name suggests), Ingram’s compositions tend to be more metaphoric. For instance, portraits of Aimée Powell-Twagirumukiza and Ijeoma Oluo intentionally evoke African goddesses Nyabingii and Oshun. 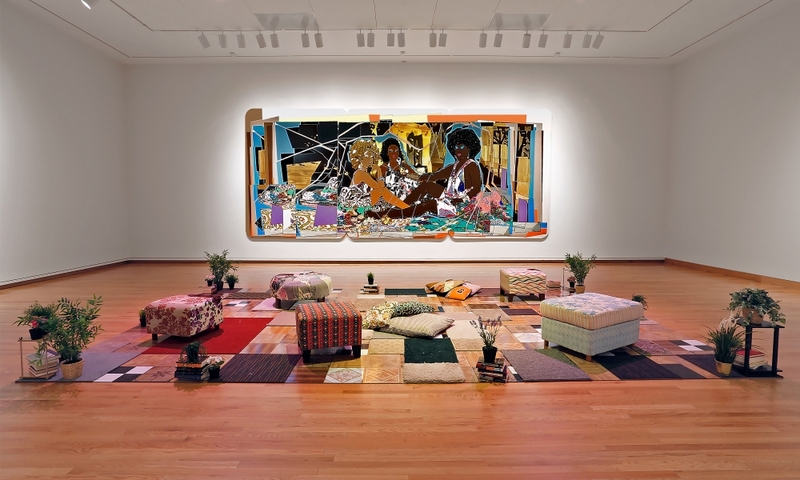 Over at Seattle Art Museum, artistic representations of blackness from the past century get a blockbuster show in Figuring History, featuring works by Robert Colescott, Mickalene Thomas, and Kerry James Marshall. Perhaps no other living artist has refigured representations of blackness in painting as much as Marshall, whose decades-long career has been defined by inserting contemporary treatments of black figures into compositions emulating classical paintings in the Grand Manner (by Jacques-Louis David and Jean-Auguste-Dominique Ingres, for example). Combining these with works by Thomas and Colescott means means Figuring History is bound to be a stunner of a show. In short, if we are ever to learn from history, we have to truly learn how to read it and write in the first place. To that end, the programming around these shows is also worth noting. SAM and NAAM will partner to present the Complex Exchange lecture series. For Everyday Black, NAAM executive director LaNesha DeBardelaben and director of education programs Eve Sandford will foster educational dialogues and lectures about black culture throughout the show’s run. Let’s hope that the conversation isn’t peaking, but rather that we’re just getting started.